Back in May, I raved about Startup Weekends, those intense hackfest-like camps where strangers meet, form companies and pitch product or service ideas for the possibility of winning startup capital and support. It's everything I love: fast-paced, interactive, collaboration-based and tons of fun. And it's back! Startup Weekend Ottawa (SWO) is happening next weekend, October 18-20 and it's not too late to sign up! If you're wondering what it is and if it's right for you, I covered all that in my first Startup Weekend Ottawa post. This time around, I want to give you a peek into what it takes to do well at one of these things (and why they're so fantastic). Startup Weekend is a global movement with over 1,000 events a year and 100,000 participants.The goal of SWO is to find companies worth continuing. The startups are the key. Cheryl explained, "It's more about after the weekend than the weekend itself." Royce expanded: SWO is intended to "teach people what it's like to start something, proactive with an idea instead of sitting on it." Apparently, as more Startup Weekends happen in a given community, more ideas become businesses. By virtue of holding these events, people are motivated to do something with their ideas. The non-dev tickets tend to sell out first, and the dev tickets don't always sell out. (which I find interesting, because these types of hackfest/ camp events usually appeal to that demographic). When I visited the May event, I found a good demographic mix with about 20% females, and the majority of folks in their 20s-30s. Interestingly there was a mix of backpacks and jeans, suits and everything in between. People knew why they were there: to network and work. For example, I noticed that no one was on their phones during the networking portion. Pitches vary wildly in content between Friday and Sunday nights; they evolve significantly as the teams work on them. Royce cautioned people to keep their ideas simple: "There is something naturally complex to simplicity." The readiness of prototypes by the end of the weekend varies significantly from paper to completed apps, and that has no bearing on the selection of the winner. What wins is a sound idea with a solid plan: what wins is the team that remembers they are there to build a business, not build an app. Part of finding a good idea is finding people you can work with. Look for a diversity of skills. Look for customer validation: hit the pavement as soon as you have a concept somewhat fleshed out. Know how to get data you need and turn it into insight to back up your pitch. Cash is king: need a good revenue source to win the weekend and an interesting revenue stream to prolong it post-weekend. Sound like your kind of fun? 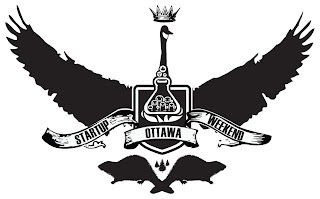 Check out the Startup Weekend Ottawa site for more info and maybe I'll see you next weekend!